We strive to provide complete care for our patients. Learn more about our special offer. Our chiropractor in Atlanta, Dr. Craig A. Senft, has been providing superior chiropractic care to patients who suffer from a variety of injuries and chronic and acute conditions since 1985. Whether you have back pain, neck pain, shoulder pain, head pain or discomfort in your extremities, we offer natural solutions that can help you avoid costly surgery and prescription pain medications. If you are looking for pain relief with a conservative, non-invasive approach, chiropractic care in Atlanta at Senft Chiropractic may be the ideal solution for you. We proudly serve Atlanta and our surrounding communities of Brookhaven, Embry Hills, Chamblee, and Tucker. Contact us today! As a second generation chiropractor, Dr. Senft understands the valuable relationship between health and spinal alignment. Unfortunately, our day to day lives can be taxing on the body, and even the slightest twist or turn can cause vertebrae in the back and neck to slip out of proper placement. This results in impingements on sensitive nerve endings and causes tremendous pain if left untreated. Furthermore, spinal misalignments can block other pertinent nerve communications that weaken the body’s response and immune systems to cause secondary health conditions and physical discomfort. Chiropractic care offers more than a basic diagnosis and treatment plan. Our chiropractor and his team are on a mission to uncover the deep-rooted causes of what is sourcing your pain, rather than masking the symptoms with superficial treatments or drugs. Our goal is to provide you with holistic, natural relief using non-invasive techniques that are proven effective and backed by scientific research. Because numerous injuries and health conditions can be attributed to spinal alignment problems, chiropractic care is an optimal solution for both healing and pain relief. 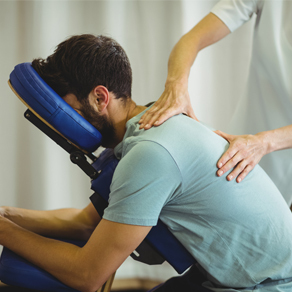 With spinal manipulations, physical therapy, decompression treatments and physiotherapy techniques, we provide affordable and effective holistic remedies for a number of painful conditions. Back pain is by far the most common complaint of our patients. Back pain can be caused by a number of conditions ranging from herniated discs and subluxations to neural impingements. Just sleeping wrong can cause your back and/or neck to ache, but most neck pain cases we see are due to whiplash from car accidents or sports injuries. However, we can treat pain beyond the back and neck with chiropractic methods. We offer effective therapy for headaches, migraines, and carpal tunnel syndrome, knee pain, shoulder pain, leg pain, fibromyalgia symptoms, TMJ and much more! Schedule a consultation and diagnostics session with our Atlanta chiropractor today to discover how we can help you enjoy a pain-free and healthier life with natural techniques. Contact us at (404) 633-6787 to make an appointment. Dr. Craig A. Senft is the director and chiropractor of Senft Chiropractic of Atlanta, which provides chiropractic consulting and health care to the people of Atlanta and its surrounding areas. Dr. Senft is a 2nd generation chiropractor and has been in practice since 1985. Dr. Senft is a wonderful chiropractor who has increased my mobility. I am active and I like to work out, but yet, I can be stiff. generally I am sitting at a desk during the day, and sometimes i am at my computer at night and it makes my upper back and neck like a board. when I first began seeing Dr. Senft my body did not 'crack' very much on adjustments, but now it's snap, crackle and pop! I can now turn my head from side to side without pain and I am much more flexible. I highly recommend Dr. senft! p.s. he's friendly and funny, too!